The music I wish to talk about here is often named «Trad» by the younger generation. «Identitairs» is a pun; a mixture of «identity» and «airs» (which means «tunes» in french). A word to coin the fact that traditional music often helps to define a people's identity. The term «Québécois» is also relatively new — late sixties, with the awakening of Quebec's nationalism. Before this, the descendents of the French settlers of the St Lawrence valley(1) called themselves «French-canadians», and before that, simply «Canadians». But, let us put these semantics aside. My intent is to explore the music that was traditionally played during my forbearers festivities. A music that is lately becoming more and more popular thanks to groups like La Bottine souriante, La volée d'castors, or Belzébuth (one of my favorites). 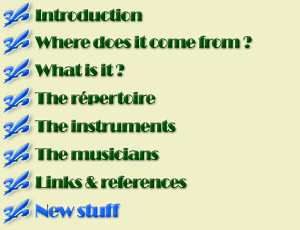 Before this rebirth, french-canadian music was carried by a series of masters such as Joseph Allard, Alfred Montmarquette, Isidore Soucy, and, more recently, Louis "Pitou" Boudreault, Jean Carignan and Tommy Duchesne. Moreover, lets not forget contemporary composers who continue to contribute to the «traditional» repertoire ― although the term loses a bit of its signification in such a case. I'm thinking here of people like Jean Duval, Pascal Gemme and Michel Faubert. By clicking on the themes below, you'll enter the heart of the matter. But before this, I would humbly ask the readers to be lenient; the author being an amateur (and, also, a novice musician), and the present site being under construction. You must also expect that the information included herein will change from time to time (improving and increasing, it is hoped). For those who want to learn more on the subject, you will find a page (here) where interesting links are collected ― links to pages from which I have blithely plundered information. Of course, comments and suggestions are welcome. Just click on the envelope at the bottom of each page. Notes : (1) There are also, in America, descendants from French settlers in Acadia and New-Orleans, but that is an other story.